Planned Parenthood collected $1.5 million a day from taxpayers last year despite across-the-board drops in non-abortion services. The nation’s largest abortionist received $554 million taxpayer dollars in the 2015 fiscal year, according to Planned Parenthood’s most recent annual report. The taxpayer haul accounted for more than 40 percent of all revenue and was nearly $30 million higher than the previous fiscal year, a five percent increase. Despite the surge in taxpayer funding, Planned Parenthood’s cancer screenings, sexually transmitted diseases, and contraceptive services all fell during the year. The pro-life group SBA List dissected the group’s annual report to draw a picture of the return on investment taxpayers receive for the half-billion dollars it sends to the abortionist each year. Contraception services fell nearly 20 percent on the year, while cancer screenings plummeted by nearly 30 percent; STD treatments dropped by six percent. The only services that didn’t seem to be affected were those related to abortion. Planned Parenthood has performed nearly one million abortions over the last three years. That practice only decreased by one percent last year in contrast to the sharp declines in other areas. Planned Parenthood did not return request for comment. Pro-life activists pointed to these numbers as proof that Planned Parenthood is first and foremost an abortion provider, rather than the "women’s healthcare organization" that Democratic politicians describe it as. "Their latest annual report is proof this public policy change is well-warranted. Despite a five percent increase in taxpayer funding, Planned Parenthood’s cancer screenings, contraceptive services, and STD testing have dropped dramatically in the last year," SBA List president Marjorie Dannenfelser said in a release. "This profit-driven, abortion-centered business is a bad investment for taxpayers, period. Only abortions did not see a dramatic drop." Planned Parenthood President Cecile Richards skirted over the facts and figures of the organization’s services in a letter addressed to supporters at the introduction of the annual report, instead focusing on broader political areas and lobbying. "This year, we protected and expanded access to health care for women, men, and young people" the letter says. "We are constantly working hard to deepen our partnerships with allies, lobby in state legislatures, and fight in the courts when access to safe and legal abortion is threatened. Your generosity makes all this possible." The report also highlights that "we engaged in research projects leading to cutting-edge health care." The research section makes no mention of its controversial practice of delivering baby body parts to researchers. Those practices caused an uproar when videographers from the pro-life Center for Medical Progress captured top Planned Parenthood executives talking about how to "line-item" aborted baby body parts to maximize profits. The Center for Medical Progress released another video on Wednesday highlighting the findings of its investigation. 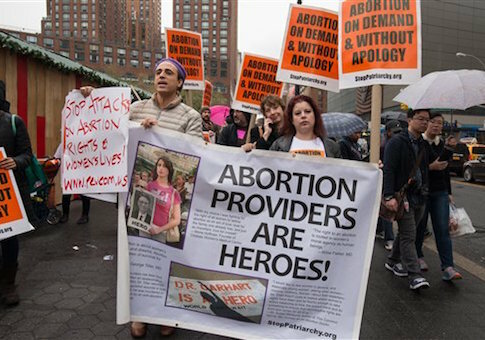 "The undercover footage released in the past half-year by The Center for Medical Progress shows medical directors and executives from the top leadership of Planned Parenthood admitting the abortion business trades baby body parts for money and indicating the profit motive undergirding these illicit sales," CMP founder David Daleiden said in a release. "Planned Parenthood has offered no convincing explanation for the money that has poured into its affiliates from fetal tissue procurement companies." The videos led to several investigations from federal agencies, congressional and Senate committees, and several states. Planned Parenthood has denied that it profits from the sales and has received nearly universal support from Democrats, including presidential frontrunner Hillary Clinton, who employees Richards’ daughter in Iowa and is the top recipient of abortionist campaign donations in 2015. Republicans have attempted to defund Planned Parenthood and redirect taxpayer funding to local health centers that do not perform abortions. Dannenfelser said that President Obama, who has vowed to veto those reforms, should review how taxpayer money is used by the organization. "We urge President Obama to, at the very least, review this report and watch the Center for Medical Progress videos released last summer before vetoing the reconciliation legislation," she said. This entry was posted in Issues and tagged Abortion, Planned Parenthood. Bookmark the permalink.